BitVest Digital Mining Corp. plans major increase in Bitcoin mining capacity, using PeerNova's ASIC mining hardware. A nationwide network of more than 4,900 payment terminals in the Ukraine now allows customers to easily buy bitcoin for cash. The network, which is operated by the country's National Credit Bank, allows customers to buy vouchers for bitcoin from a new company called BTCU. After depositing cash in a terminal, purchasers receive a voucher containing an activation code either on a printed receipt or via an SMS message to their phones. They can then go to BTCU's website to enter the activation code and claim their bitcoin. 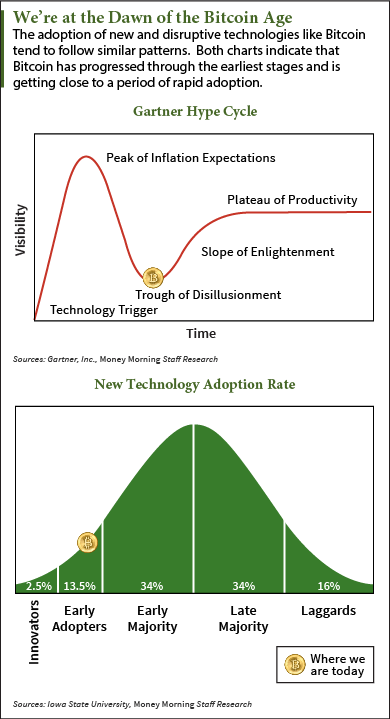 Read more..
And that means Bitcoin should follow the same dramatic patterns as other disruptive technologies - which, so far, it has. Read more..
Bitcoin is moving from its Deceptive phase to a very Disruptive phase. This post is going to explain why, and what you may want to do. I've been tracking Bitcoin since its inception, and my confidence has grown to the point where I'm now trading in a portion of my gold holdings for bitcoin, buying it and acceptingbitcoin for the Abundance 360 CEO Summit. Read more..
FAMED BANKING BILLIONAIRE CATCHES THE "BITCOIN BUG"
While there is no shortage of big name investors jumping on board the bitcoin bandwagon, one of those individuals, who happens to be a direct descendent of one of the most famous names in banking is sure to raise some eyebrows. Meet Mathew Mellon, offspring of the notorious banking family, who you can now add to the long list of bitcoin disciples. The former chairman of the New York Republican Party Finance Committee made a decision back in April that he wanted to get in on the bitcoin madness, and in doing so, he called on none other than the Winklevii for some insight. Online wallet provider Xapo has raised its funding total to $40m, leapfrogging BitPay to become the best-funded bitcoin startup to date. Announced today, the startup's second Series A-1 funding round took $20m in total. Spearheaded by Index Ventures and Greylock Partners, the round also included Emergence Capital Partners, venture capitalist Yuri Milner, PayPal co-founder Max Levchin and former Yahoo! CEO Jerry Yang. Back in March, Xapo's initial round was led by Benchmark Capital, Fortress Investment Group (FIG) and Ribbit Capital. At the time, it was the second-biggest funding round in the bitcoin space. Read more..
Bitcoin exchange itBit announced today it would relocate its headquarters from Singapore to New York City. According to a post on its blog, the company also announced it is replacing its founding CEO Rich Teo with Charles Cascarilla, a founding partner itBit's investor Liberty City Ventures. The announcement is somewhat surprising, since Singapore is often seen as a world financial and banking hub on par with Switzerland, and an easier place in which to conduct bitcoin business than the regulation-heavy world of the US. Read more..
Geoff Bascand, deputy governor and head of operations at the Reserve Bank of New Zealand (RBNZ) has said that digital currencies could one day evolve to supplant cash as we know it. In a recent speech delivered to the Royal Numismatic Society in Wellington over the weekend, Bascand described digital currencies as a "challenge to the form and provenance" of money. He outlined a number of advantages associated with digital currencies, along with the more or less usual list of concerns and risks. Read more..